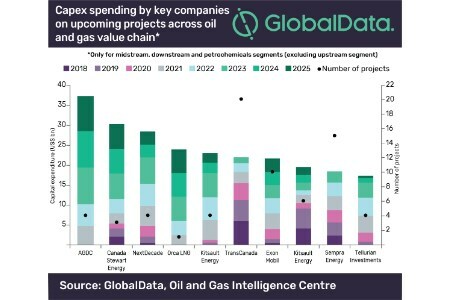 Alaska Gasline Development Corp is the top spender among all oil and gas companies in North America, in terms of new build capital expenditure (CAPEX) to be spent during 2018 - 2025, on planned and announced projects across midstream and downstream segments (including petrochemicals), according to leading data and analytics company GlobalData. The company’s report: ‘Top Oil and Gas Companies Capital Expenditure Outlook for Midstream and Downstream Segments in North America – Alaska Gasline Development Corp Leads CAPEX among Companies in Region’ reveals that AGDC tops the list with CAPEX of US$37.3 billion followed by Canada Stewart Energy and NextDecade Corp with CAPEX of US$30.3 billion and US$28.4 billion, respectively. On the midstream side, AGDC is expected to lead gas processing segment in terms of new-build CAPEX. The company is expected to spend US$5.9 billion by 2025. In the LNG liquefaction front, Canada Stewart Energy is expected to spend US$28.8 billion on two upcoming liquefaction terminals. GlobalData identifies that TransCanada Corp leads both trunk pipelines and liquids storage segment with US$20.8 billion and US$1.1 billion by 2025, respectively. In the LNG regasification segment, Korea Gas Corp leads with US$1 billion to be spent on an announced regasification terminal, by 2025. Magnum Gas Storage LLC leads the gas storage segment with estimated CAPEX of US$0.35 billion. On the downstream side, Pacific Future Energy is expected to lead with estimated capex of US$14 billion on the development of an announced refinery by 2023. Kitimat Clean Ltd and Pemex follow with CAPEX of US$8.5 billion and US$8.4 billion, expected to be spent on one refinery each, during the period 2018 - 2025. In the petrochemical sector, Formosa Plastics Group is expected to lead with estimated CAPEX of US$8.3 billion to be spent on nine upcoming petrochemical plants during the period 2018 to 2025, followed by Badlands NGLS LLC Plc with estimated CAPEX of US$6.8 billion and Royal Dutch Shell with US$5 billion.